The first pro-quality drum kit that I had was a Gretsch five piece with birch shells, Ludwig hardware, and Avedis Zildjian cymbals. It was purchased second hand in the mid 1970s. After being overly influenced by Bill Bruford, a set of six Remo Roto-toms was added a few years later. As much as I enjoyed the set there were two problems associated with it. First, in spite of some nice Shure and AKG mics, it was difficult to get a decent sound out of them in my home recording studio. Of course, being that the “studio” was a basement with scant acoustical treatment and a seven foot ceiling, the kit could hardly be blamed. The second and perhaps more confounding problem was the loudness level. In fair consideration to the rest of the family and neighbors, there were limits on when I could play. I simply could not afford any manner of “sound proof” room and unlike the ubiquitous guitars, basses, and keyboards that my friends played, there was no volume control on a drum kit. As I was finishing my degree in electrical engineering at the time, I was hopeful that there might be a technological solution down the road, something more advanced than the “beep-boop” Syndrums of the day. In the early 1980s I abandoned my kit for a brand new Simmons SDS7. The SDS7 was their top of the line analog-digital hybrid. Although I was not a huge fan of the earlier SDS5, the SDS7 attracted my attention because it used digital samples of real drums. Further, there was the promise that Simmons would be producing an EPROM burner for it so that you could make your own sound chips. The SDS7 pads consisted of a plywood base covered with a synthetic rubber batter surface. Underneath was glued a single piezo pickup (of course, this arrangement leads to a hot spot directly above the pickup, but Simmons solved this problem by placing the pickup toward one of the edges and underneath the raised Simmons logo as no drummer would want to strike that uneven surface on purpose-a neat trick). The sounds in the SDS7, although usable, were anything but realistic. The relatively low pad noise was an absolute joy to the surrounding non-drummers and whatever I heard in my headphones was exactly what went to tape. Granted, the pads didn’t respond like regular drum heads but I wrote that off as a requirement of the medium, not unlike the difference between a plastic synth keyboard and an acoustic piano. There were two major problems with the Simmons. First was the lack of realistic sounds which limited the sort of music you could play. Second, this particular SDS7 had a nasty habit of reprogramming itself and losing all of its presets. Not wanting to deal with either a buggy unit or limited musical options, it was soon heading out the door. Fortunately, digital drum machines were beginning to get popular and they sounded much more like real acoustic drums. A keyboardist friend had picked up an Oberheim DMX which was a card-based unit. That is, the DMX contained a series of “sound cards” (printed circuit boards with an edge card connector), one per drum. His particular set up consisted of a basic kit with ride and crash cymbals. While the sounds might be laughable by today’s standards, they were light-years ahead of what they replaced (such as the analog Roland TR-707). The DMX also featured trigger inputs for each card. These are not to be confused with the sort of trigger inputs you’d find on a modern drum unit though. The DMX required a nice, square logic pulse to trigger the sound, piezo triggers need not apply. A further complication was that there was a single volume level meaning no playing dynamics. But the sound was seductive and I set off designing and building an interface card. The input would come from piezo-based pads that I had designed. This would trigger the DMX, the output of which was fed into another input on the interface card that operated a synth-style VCA (voltage controlled amplifier) to create dynamics. So the card had trigger in/out and audio in/out. There would be one interface card for each sound card in the DMX. In any event, the prototype interface card was tested with the DMX and worked as expected. I etched a bunch of PC boards but before sufficient funds could be saved for the DMX, something happened. That something was the introduction of MIDI in 1983 and the explosion of new gear in the following couple of years. MIDI changed everything. Suddenly, old analog synth style triggers became obsolete. The handwriting was on the wall. So I abandoned my interface cards (I had built a few though none still exist, all that remains is the original PCB artwork). Fortunately, I hadn’t plopped down the cash for the DMX yet, so I shifted to saving for MIDI gear. Although the original focus of MIDI was on keyboards, it soon spilled over to other devices. By 1985, two new pieces of gear caught my attention: The E-Mu SP-12 sampling drum computer and the Sequential Circuits Prophet 2000 keyboard sampler. 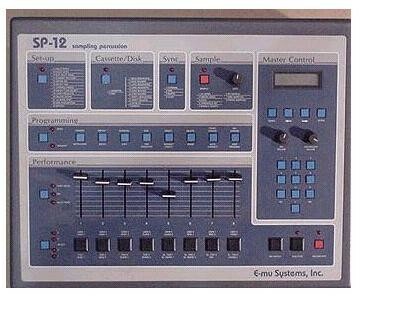 The SP-12 featured 12 bit sampled drum sounds and you could record your own as well, up to a couple of seconds total. I had no use for the pattern programming abilities. All I cared about was the sound engine. I purchased one of the first units to hit New York state (for somewhere around $2500 if memory serves). The SP-12 was hooked up to the 2×4 pad unit via the brand new J L Cooper Drumslave. The Drumslave was one of the first (if not the first) trigger-to-MIDI converters. It was housed in a standard single unit 19 inch rack chassis. Each trigger input was assigned to a specific MIDI note number. There were no adjustments to speak of. At the time J L Cooper was known for making odd little interface devices for niche markets. So, the kit now consisted of the 2×4 box plus a home made kick pad that used my old Ghost kick pedal. This fed the Drumslave which fed the SP-12. The crazy thing is that it kind of worked. That alone thrilled me. And it was tiny compared to an acoustic kit. Of course, there was no hi-hat and the technique required considerable change over a normal acoustic kit, but I had real drum sounds with a volume control. The Prophet 2000 offered a big jump in sampling time and quality over the SP-12 so that became a “must buy”. One was procured in late 1985/early 1986. It was also 12 bit but had a maximum sampling rate around 42 KHz and longer sampling time (over six seconds!). It also had a variety of features for voice layering and dynamics adjustment. These helped to reduce machine gun artifacts and also lent some sonic variation besides a simple loudness scaling. Ah yes, the fun we had with voltage controlled filters and dynamic sample start points! A particularly weak point of the SP-12 was its cymbals, so my Zildjians were sampled with the P2000. To get a reasonable ring-out, the cymbals had to be looped toward the end and faded with a VCA. This was no easy task and it eventually spawned a computer-based visual sample editor by my little software company (Sample Wrench by dissidents). Anyway, after spending in excess of $5k, we were getting somewhere. But wait, it gets better. By early 1986 the Drumslave was retired in favor of the recently released Roland Octapad Pad-8. It was lighter than my trigger box (although not as pretty) and had a variety of editable parameters that the Drumslave lacked, such as velocity curves, channel and note numbers, etc. I was getting a little tired of the 2×4 pad arrangement so I decided to create some new pads using my old Roto-tom hardware. After a little minor surgery to the Octapad, what resulted was something that began to look like a modern e-kit. I dubbed the unit “Zelda”. About this time (circa 1986/87) I began writing a monthly column on MIDI drums for Modern Drummer magazine. Eventually, I wrote an article about Zelda which was published in the May 1988 issue of Electronic Musician magazine (see here). I was also busy reviewing electronic percussion gear for EM and other publications so I got my mitts on a number of other devices along the way. I was pretty happy with Zelda although the kick pedal solution was sub-optimal and I still didn’t have a hi-hat pedal. If you’re wondering how you get hi-hat sounds without a pedal, the hi-hat consisted of two pads, one triggering a closed sound and the other an open sound, set for mutually exclusive triggering. Thus, if you hit the closed pad it immediately shut off the still ringing open sound. The kick pedal problem was solved thanks to a new company called Engineered Percussion. 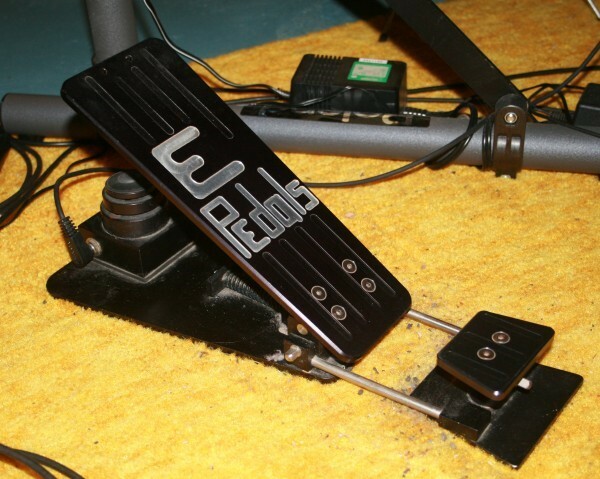 They made a product called the E-Pedal, a beaterless kick pedal. The E-Pedal was built like a tank but required a change in technique. It was a little bit of a hassle at first but I adapted. In fact, I bought a second unit and have been using them ever since. I’d buy a couple more if I could find any out there in good shape. Unfortunately, Engineered Percussion soon discovered that most drummers were not willing to learn a new technique and they moved to a beater style pedal. This sort of intransigence on the part of many drummers has always bothered me. What would have happened to synthesizers if keyboardists demanded a piano or organ-like clavier? What if guitarists had insisted that electric guitars look and feel like their acoustic counterparts? Interestingly, Engineered Percussion eventually changed its name and product line. They are now known as Axis Percussion. Check out this article about EP/AP for a historical overview. Always an evolving kit, Zelda soon shed the P2000/SP-12 sound sources in favor of the new E-Mu Procussion sound module. The Procussion grew out of their very successful Proteus line of rack mount synth modules. It sounded better, had far more sounds, and only took up a single unit rack space. Now we were talking 4 megabytes of 16 bit samples at full bandwidth; hundreds of them and organized into 64 user kits in stereo no less. AND there was no booting up the P2000 and loading in kit sounds via a 3.5 inch floppy disk drive! This was perhaps the most stable version of Zelda, meaning it didn’t change much for a few years. 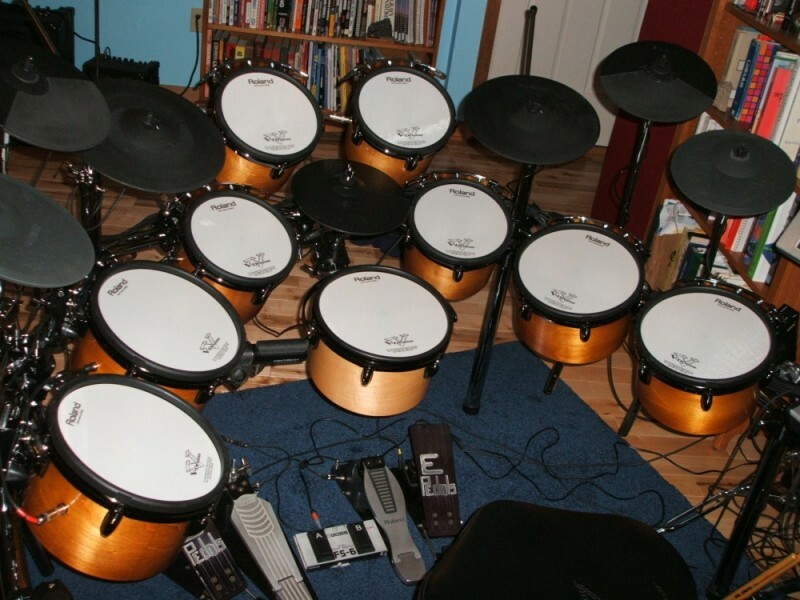 Zelda was largely dismantled in the early 1990s when Roland introduced the TD-7. The TD-7 became the core of the new kit although the E-Pedals stayed. The modified Octapad was used to trigger the Procussion unit for special effects and the odd percussion sound. Things had come a long way from the Drumslave/SP-12 combo. Sometimes I could close my eyes and fool myself for a moment that I was playing a real kit, mic’ed, through headphones. Anyone who has used a TD-7 knows that the user interface is less then ideal, but for someone who had been doing it since day one, many of the parameters made perfect sense. Eventually, the TD-7 was replaced by a TD-20 (since expanded). More pads were added and the TD-7 filled a new role as a trigger-to-MIDI device. So, by 2010 the kit was based on an expanded TD-20 but still used the TD-7, Octapad, Procussion, and the two E-Pedals; some parts being over 20 years old. It also still used the PD-7/8/9 series tom pads. I had been playing rubber pads for over 25 years and had become so accustomed to them that I couldn’t see spending the money on a complete set of commercial mesh pads. Of course, there is something to be said regarding the aesthetics of nicely finished wood and in the winter of 2011 I began experimenting with a DIY tom system that used acoustic drum shells with the now standard “mesh” drum heads and internal triggering electronics. By that summer I had finished with the prototype tweaks and began working on the new system. 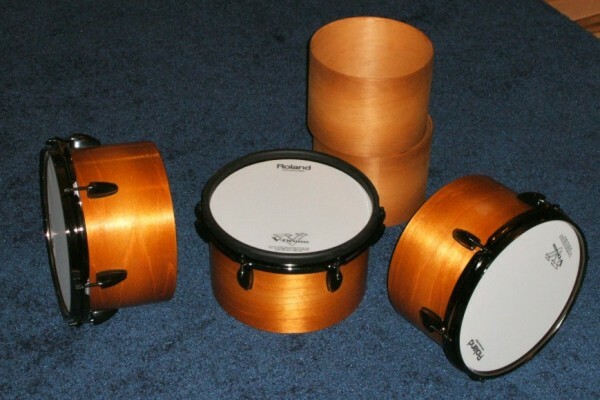 This featured a series of 8 and 10 inch toms with 6 inch deep birch shells. Black rim and lug hardware was used to balance the subtle dark-light-dark fade applied to the shells. To keep a little more of the grain, dye was used in place of stain. The shells were finished with multiple coats of tung oil. A new rack was created to hold these heavier toms (versus the old rubber pads). And thus we reflect on the journey. Nearly 30 years of experimenting and tinkering and at last I have a kit that doesn’t make a lot of noise, looks decent and has a volume control. Nobody said it would be easy. Worthwhile adventures seldom are. This entry was posted on February 12, 2012, 7:24 am and is filed under Audio Island, Fun Is Where You Find It, More Art, Then Science, Pattern Juggling, Sounds Cool, Techies & Technology, What The Heck Is That Thing?. You can follow any responses to this entry through RSS 2.0. Both comments and pings are currently closed.